A tiny tone transformer to boost your sound. Noticeably improves your tone. More control options than you'd think. Classic Page and EVH sounds. The Echoplex EP-3, although designed for its primary role as a tape echo, featured a nice-sounding preamp that guitarists such as Jimmy Page, EVH and Eric Johnson used as a tone booster in front of their amps - it's the sound of that pre-amp that Xotic's EP booster seeks to emulate. "What you are getting here is a tone enhancer - stomp on it and things just sound better"
On the surface it looks simple, with just a single knob to dial in up to +20dB of boost, but internal DIP switches give you options, one selecting whether the pedal (with no boost dialled in on the knob) kicks in at unity gain or with a +3dB boost, while the other offers a brighter sound with a glassier top end. 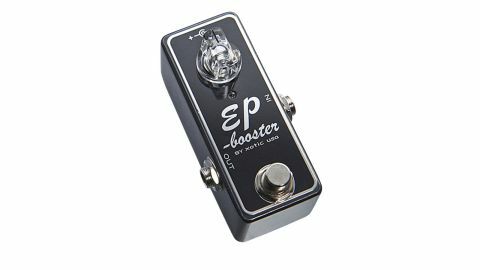 What you are getting here is a tone enhancer - stomp on it and things just sound better, with more top-end shimmer and a more defined bottom end, making it a pedal that you may just wish to leave on all the time. Tone conditioning, with or without a boost - a 'more' pedal to add character to your sound.